I wrote an article on South African emcee Tumi Molekane for the Sunday Times’ Lifestyle section which got published yesterday. In it, we discuss the process behind making his disarming body of art, Return Of The King, and speak about the artists he assembled to make it. Tumi also shares his views about South African Hip Hop, observing that though it might be the biggest it’s ever been, the scene doesn’t allow as many varied voices as it did, say, ten or more years ago when he was starting out. I’d intended to speak to him about the poetry anthology he released in the early 2000s; Tao of Tumi it was called, I think. The last time I’d spoken to him was at Ramfest in 2011, so it was dope to break bread again. The Sunday Times newspaper places its on-line content behind a paywall. Find it here, or click on the image below to read. Return Of The King is out now on iTunes. Read and ENJOYED the story, in fact, and for several reasons: a) Does anyone realise something that feels/looks like Tumi’s rocking a new image? b) The super MCee says something KRS 1 have always taught the “Nation” wherever it is: there are more playas today on the mic, and less material, less or no stories, themes, ideas to explore. In short, there’s a lot of them and a lot of them are saying nothing at all. At least that’s how I read him. If so, that’s quite pertinent, something to be expected from a narrativist story telling and not only rhyme-MC. If any doubt, go check one of his earlier work a piece called “Susan.” (I stand to be corrected though). c) His views resonated quite deeply simply becoz that’s a variation of a theme and topic I raised with Kagiso Mnisi pertaining the flood of new young scribes with no original idea…young bucks jumping on the “hip” and “cool” train aiming of course, to sound like a Coltrane without paying dey dues in basic reporting, basic writing and so on. Enough about Tumi, lets pay dues someplace elsewhere-on the writer, Tseliso Monaheng. 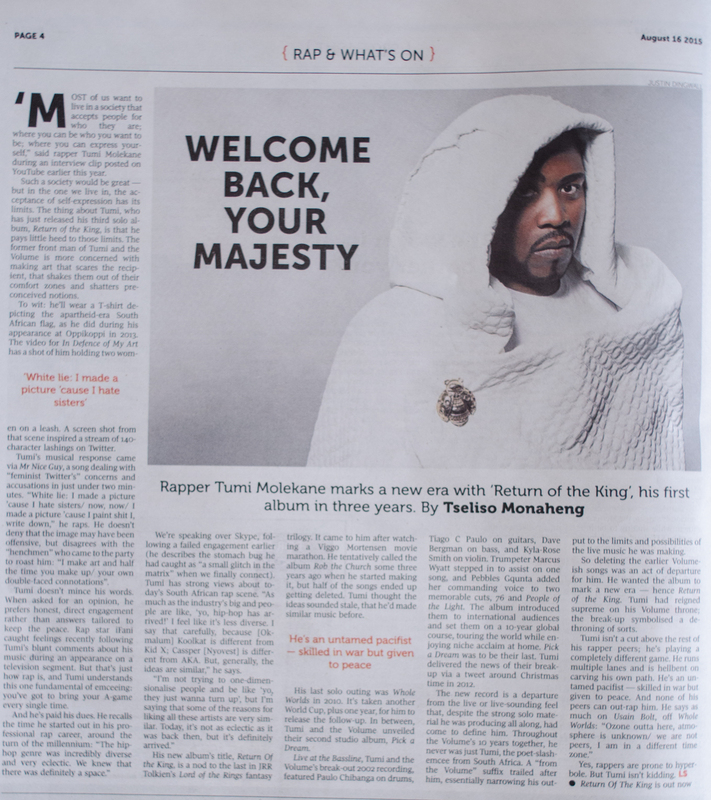 I must say though Tumi’s piece, or the version that appeared in the Sunday Times was not his best piece or best HipHop piece, overall, Monaheng is SIMPLY THE BEST; the most probing, knowledgeable, empathetic, and keen on exploring and prying open the intersection not only of the 4+1 pillars of Hip Hop but the space in between the historical memory archival secrets and lessons and the futurism attendant to any creation of any work worth the pen and the studio knobs it is’ written on…with. I find his work quite unpretentious…he writes about HipHop the way Masande Ntshanga used to write about kwaito (reviews) in Rolling Stone, well, before Ntshanga became a literary star. Keep up the inspiring job N’goana Ntsoana.